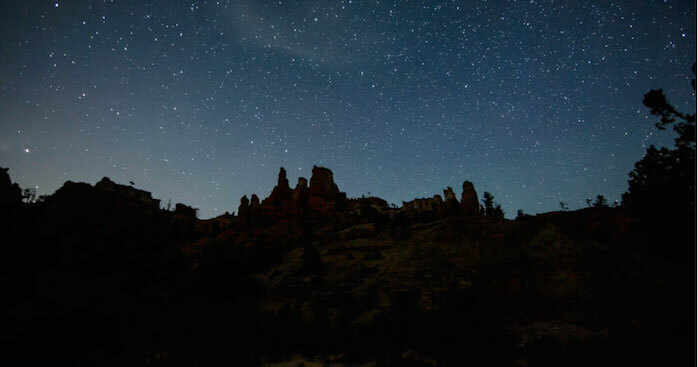 With a yearning to experience the diminishing night sky, my filmmaking companions and I flew from the bright lights of Chicago to Nevada, rented two RVs, and drove through breathtakingly beautiful terrain to Tropic, Utah. We pre-arranged an introduction to the stars with Kevin Poe, an astronomer who runs Dark Ranger Telescope Tour. Our initiation found us marveling as we peered through enormous telescopes to view the moon, Venus, Jupiter and galaxies thousands of lights years away. Gasping replaced conversation! The stunning sights strengthened our resolve to not miss a moment of the show that grew more spectacular as it grew darker. Spontaneously, we changed our plan to camp at a lodge, agreeing that neither artificial light nor driving should interrupt the emerging spectacle overhead. So, on a remote tract of Utah, we sat in $9 folding chairs – the best seats in the house for the greatest show we’d never seen. Above us, shooting stars, sparkling stars, billions of stars. Beaming planets discernible to the naked eye. At center stage, the Milky Way, resplendent in smoky purples and golds, misty whites. We shouted primal sounds, even swore – exclamation marks prompted by celestial majesty. I present the experience here for you to share. I hope it inspires you to treasure the night sky that has inspired and colored humanity’s understanding of life for millennia, a guide that may soon disappear, a masterpiece of inspiration, and a reflection of the sparkling possibility we all share. This film was created by Mike Leonard, NBC Features Correspondent for 32 Years and Mary Kay Wall in collaboration with Jamie Fleischel and Corey Lillard. Enjoy! inCommon with Mike Leonard: Awe from The Telling Well on Vimeo.